Well, hell…I am so far behind on my blog posts about our farm visits (and it doesn’t help that I keep taking time to research and write my article, Where Our Food Comes From) but I’ll try and get us caught up while still giving each farm visit its fair shake. Mid-July, we left upstate New York and headed to Great Barrington, MA for a week at a small, grass-fed dairy farm that also raises hogs, veal, goats, chickens and tomatoes. The farm was actually two farms about 10 miles apart with a few additional fields in between where calves and goats grazed. The work days there were the longest days of our entire trip – we started at 5:45AM and ended at 7:00PM. Six days a week. 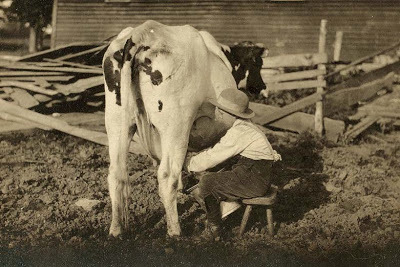 13 cows (and six younger cows in training) were milked twice a day. 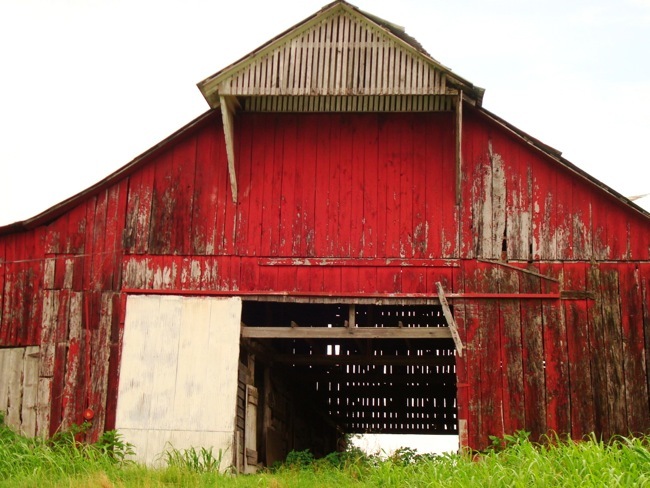 Barns and milking equipment were cleaned twice a day. Calves and goats and hogs were fed daily. Fences were mended and new fence lines set every day we were there. Frankly, I didn’t agree with the farmer’s idea of what sustainable farming should look like (I guess I wasn’t alone in my assessment as this farm is no longer a WWOOF farm member). The folks who actually ran the farms – two apprentices who earned $500 a month each, and seven unpaid interns – were young and earnest and they all seemed to be OK with the prospect of working 60-hour weeks for the benefit of absent farm owners…I was not. It’s not that the farm owners didn’t work, quite the contrary, one is a celebrity chef and owner of a couple 4-star farm-to-table restaurants in New York City…plus he’s been giving TED Talks on sustainable farming practices. Imagine that…sustainable farming practices…nine staff members (and two WWOOFers) working 60 hours a week and paying out $1,000 a month for labor. Dinner for two at one of his restaurants costs more than the whole farm staff earns in a week. But, the apprentices and interns were a fun group from all over the globe. The youngest one (from Germany) was 16 and the oldest (besides us) was not-quite 30. Each had signed on for a term of one month up to one year. We enjoyed our time spent with them, but I could not stand the hypocrisy of the situation and we left five days ahead of schedule. We spent the next week in Hanover, NH at the childhood home of our dear friend, Emily James. Her mother, Ann, was kind enough to put us up and treated us to many good meals, including lunch at Simon Pearce Restaurant overlooking a waterfall in Vermont on my birthday. Anastasia scheduled a massage for me that day as well and, later, we picked up seven pounds of live lobster, and steaks (not live) and I put them on the grill for dinner. After six weeks of farming, we took full advantage of Ann’s hospitality and the opportunity to relax in her spacious home in that beautiful part of the country. While in New Hampshire, we rented a car and made a quick run into Boston – my first time there. We walked the historic Freedom Trail, had some chowder, steamers and beers at the Union Oyster House (America’s oldest restaurant, 1826), and an amazing home-cooked dinner with Anastasia’s friends, Mel and Michelle. After dinner we jumped on a train to catch a Red Sox game but it got rained out. One of Emily’s friends from high school, Anthony Iarrapino, is now an environmental lawyer living and working in Montpelier, VT and we were able to spend a couple days with him and his partner Jocelyn (also an attorney). We met Anthony and Jocelyn for lunch and they joined us that evening after dinner and we went drinking and dancing at a newly reopened club in Montpelier…a fun night with a very high-energy couple! One might never guess that Montpelier is the capitol of Vermont – it’s a funky little town of 9,000 people, half of whom are grayed, pony-tailed and wearing tie-dyed t-shirts and peace symbols. The town has a small arts college, half a dozen book stores and coffee houses, a very large grocery co-op and a good (if somewhat pricey) farmers market on Saturdays – it is a little slice of heaven for the retired hippies and eco-warriors living there. We both enjoyed the vibe in Montpelier and Vermont immensely. 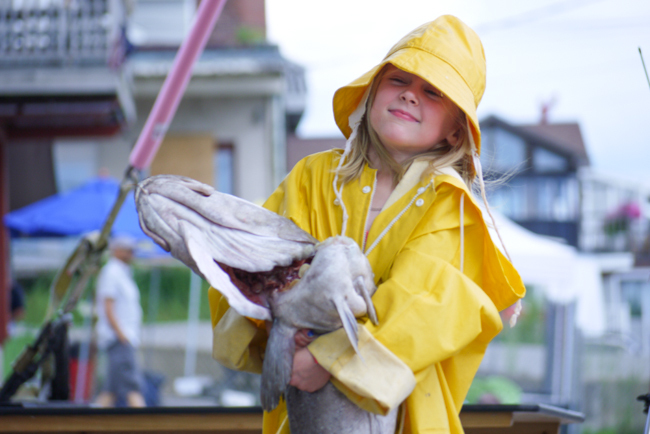 After Vermont, we headed north to Rockland for the Maine Lobster Festival. It was to be our mid-expedition break and a chance to celebrate my 50th birthday…we hadn’t planned on spending the prior week off as well, so, as it turned out, we enjoyed a two-week mini-vacation in New England. 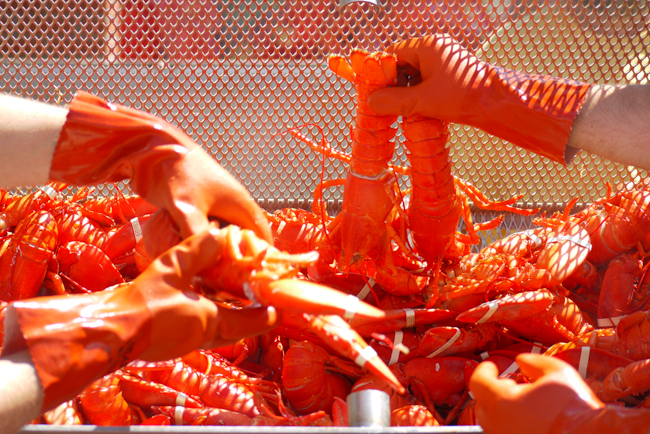 From ocean to pot to plate…the Festival served over 14,000 pounds of lobster in four days. 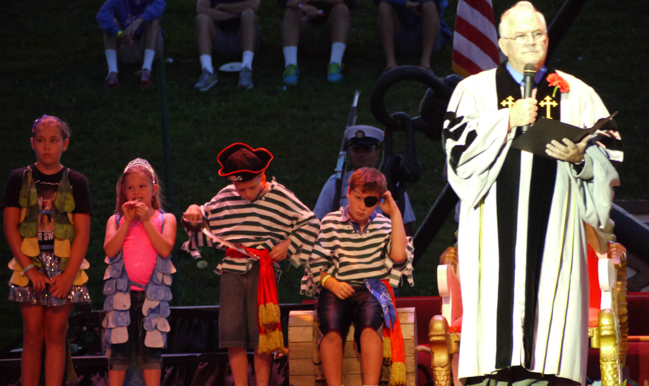 A stern benediction attended by restless pirates. Ladies and gentlemen, your 2013 Lobster Queen! A ridiculous race pitting small children against a giant cod and the clock. You think it’s so easy to eat in a lobster in under a minute? You come up here and try it. 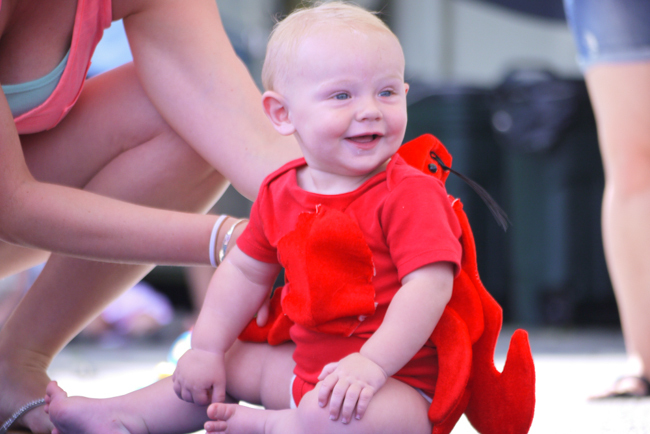 Go figure…after four days of devouring lobsters hand over fist Mainers dress their babies up as one. 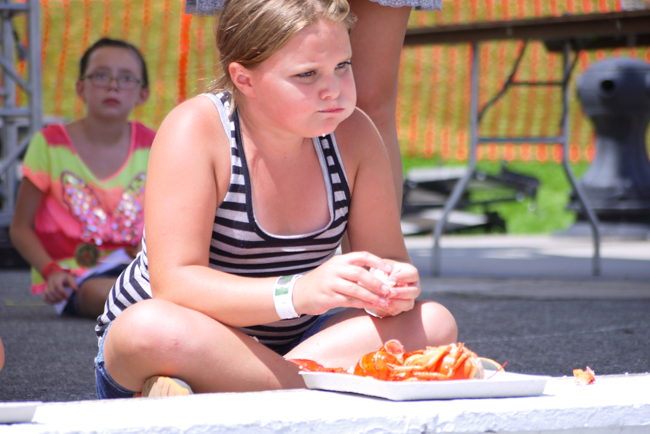 Lobster Festival is just what it sounds like…awesome! Fresh lobsters $4.00/pound. Lots of them. With butter. On a roll. On a Club sandwich. In a lasagna. Not to be missed are the lobster eating contest, lobster crate races, cod-carrying race, Lobster Queen pageant and lobster baby costume contest. 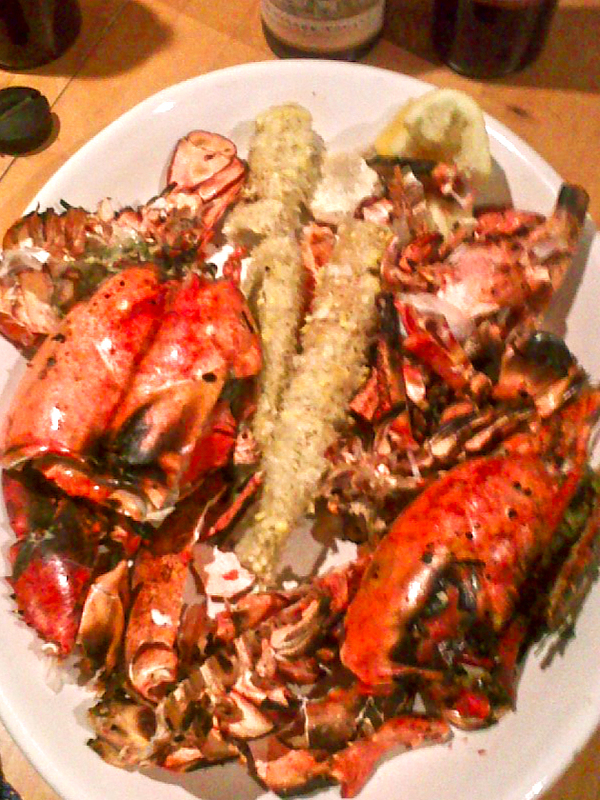 There are simply lobsters everywhere. The festival served over 14,000 pounds of lobster in four days and who knows how much more the local restaurants served. The festival also included arts and crafts and vendors and the musical headliner was…wait for it…David Cassidy. We passed on David and went into town and grabbed another incredible ice cream at Thorndike Creamery. I might have heard “I Think I Love You” far off in the distance…though I might have just wished it to be. 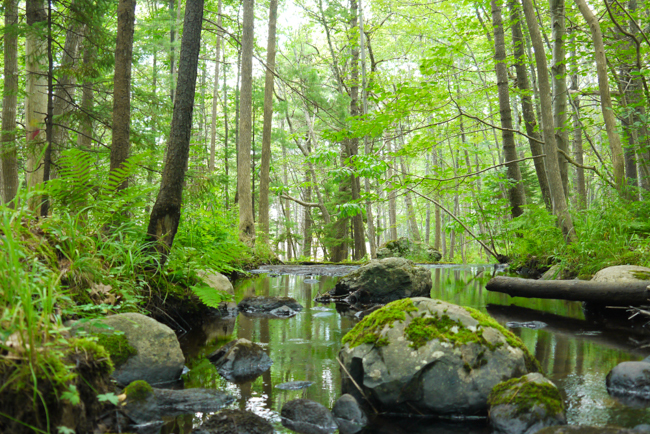 Varnah Brook at Megunticook Campground just outside Rockland, ME. 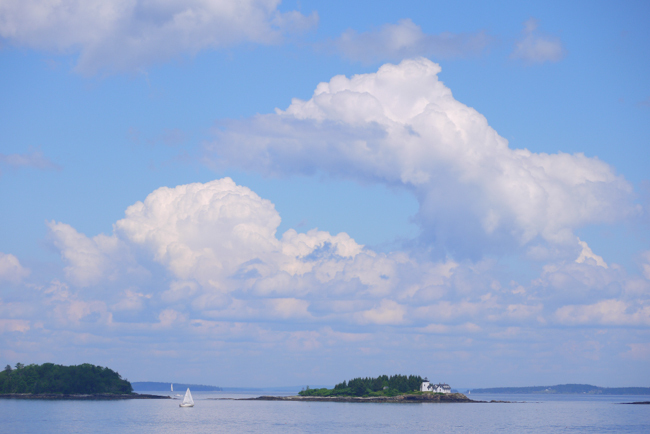 Hundreds, maybe thousands, of small islands dot the fractured coast of Maine. Maine was lush and green and smelled of the ocean – I didn’t know how much I would miss that smell until it was gone. Maine was one of my favorite stops on our trip – of course, we were there in August and the weather was perfect, 75 degrees and sunny, though we did get a day or two of intermittent rain (FYI – I checked and the low was 5 degrees there today). The people of Maine are very friendly and generous and they stand out proudly like tall trees against the rocky coast. The little port of Rockland is a good-sized town with just enough to do and see but not too much to ever feel busy. It’s the type of place where you don’t mind that most things take a little extra time and even strangers have a kind word or a good story to share. We thoroughly enjoyed the Farnsworth Museum; it hosts a collection of works from the overly-talented Wyeth family – N.C., Andrew and James – along with a surprisingly adequate and eclectic collection of contemporary art. Anastasia caught her first fish ever when we stopped to bait fish! 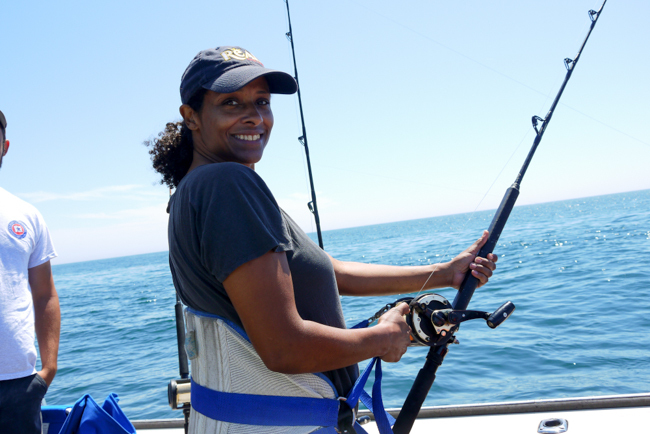 Anastasia surprised me with an additional outing for my birthday – shark fishing! 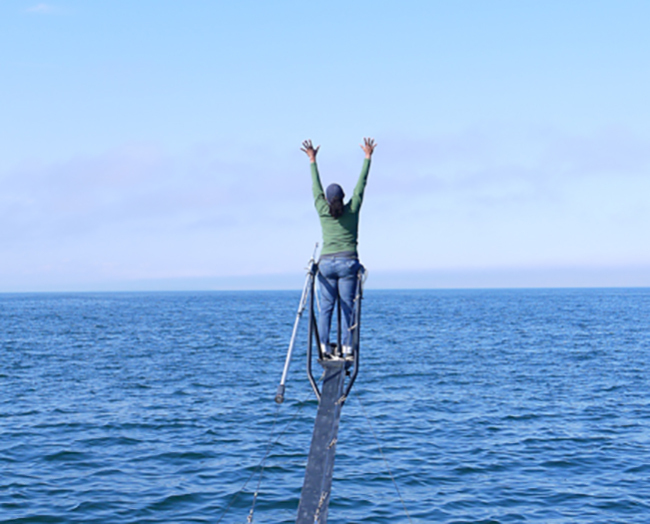 On the foggiest morning of our entire stay in Maine, we awoke early and felt our way in the Schwartz along the Rockland peninsula out to Port Clyde Harbor and Captain Dave Sinclair’s 38′ boat, the “Lady Anne”. Captain Dave is a legend in those parts. 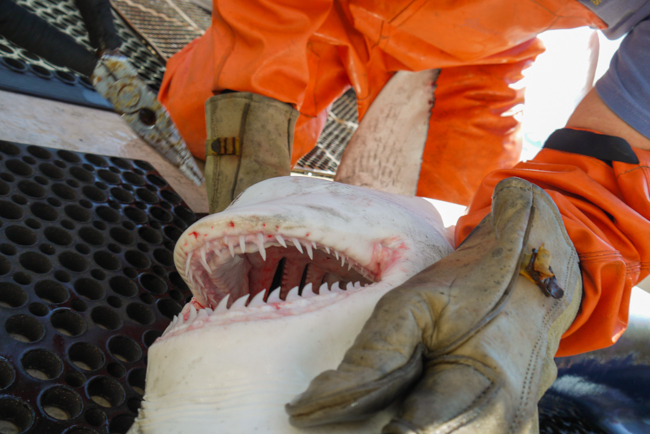 He has been catching, tagging and releasing sharks for over 20 years. He also fishes for giant Bluefin Tuna, he is pictured with a 900 lb. tuna on the “Lady Anne”. He teaches SCUBA, leads dive trips and shark cage expeditions and is the only man to call if your truck breaks through the ice while ice fishing in Maine – yes, he’s an ice diver, too. And he was a hell of a nice guy – he worked us onto his boat that morning on a sort of friends and family excursion with his wife, two of his friends and a couple of his colleagues. 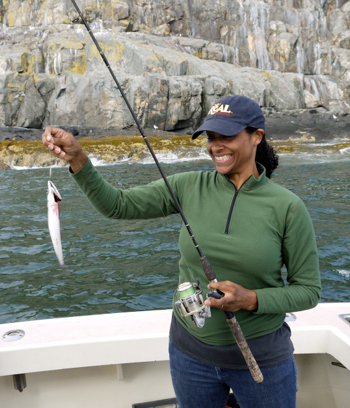 I had never caught a shark before and Anastasia had never caught a fish of any kind so the day promised to be a first of many kinds. And it was – all six passengers caught a Blue shark that day, ranging in size from a little over 5 feet to just over 8 feet in length. 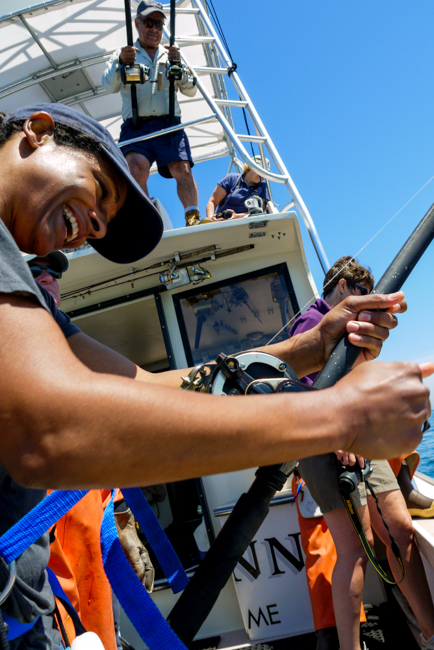 Each fish was brought aboard, measured for length and girth, tagged with a tracking chip, photographed and released. Captain Dave uses relatively small titanium hooks and he files the barbs off so as not to cause the fish damage when removing the hooks. Sharks tagged by Captain Dave in Maine have been recaptured (and retagged and rereleased) as far away as Cuba and Africa. The network of fisherman who participate in this type of ongoing research are an important aid in helping us to understand the behaviors and territories of these beautiful and over-fished creatures. No more mackerels…I’m ready for the Big One! 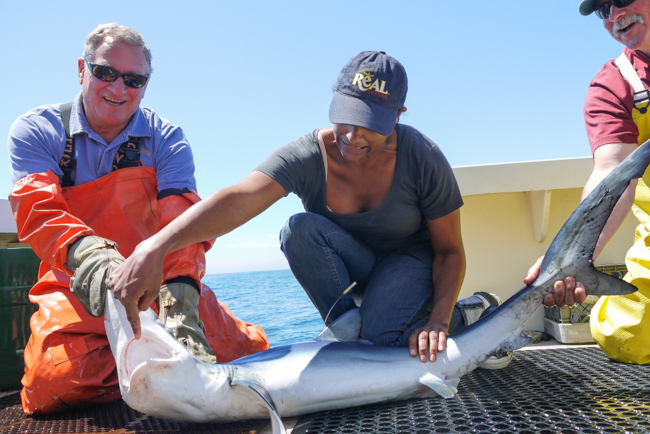 Captain Dave, his deck hand, a 63″ female Blue Shark…and a comedian, of course. This big Blue came in just over 8 feet. Where are your fingers now, funny girl? Leaving Maine was difficult, I liked everything about it. And we had been off the farm for two full weeks and, as much as I had enjoyed our previous farm visits, I had gotten a little soft and, well, vacationing is fun. Next stop…Herkimer Hill farm in Cabot, VT.
JC Jaress has been looking for something his entire life and he's pretty sure it's been looking for him as well. Whether they find each other is not nearly important as the little dance they're doing. 2 Responses to Farming or Vacation? You guys picked out some nice stops. Maine looks beautiful. Thanks, Ryan. Yes, Maine is gorgeous, though it’s a bit colder there now. We’re headed to Ecuador and Nicaragua next month. Where are you now?